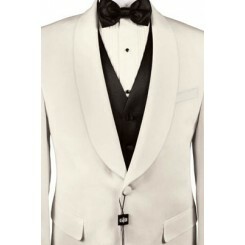 This is a classic white shawl dinner jacket, featuring a 1-button closure. Dinner Jackets are not just for dinner anymore! They do not feature satin lapels and have become a very popular choice for prom tuxedos since Jay Z wore an ivory dinner jacket with black pants to the academy awards in 2014. Available with contrasting black pleated pants, flat front pants, or slim-fit flat front pants. 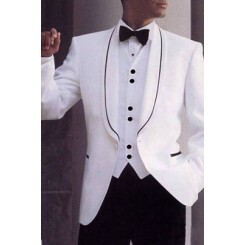 If you are looking to build a complete tuxedo ensemble using the CARDI White Shawl Dinner jacket, please visit our easy tuxedo-builder program. The tuxbuilder will save you money on any complete rental package.